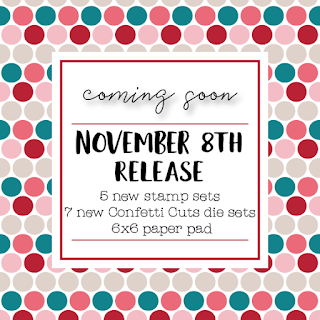 Welcome to Day Two of Reverse Confetti's November release countdown. If you missed Day One, you can catch up HERE. Today we are introducing two adorable winter-themed critter sets: SNOW BUNNIES and FUREVER FRIENDS. 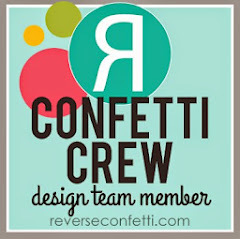 Don't miss our two chances to win a Reverse Confetti gift certificate: 1) Leave comments on each designer's blog; 2) Head over to our Reverse Confetti Facebook page for an additional giveaway. 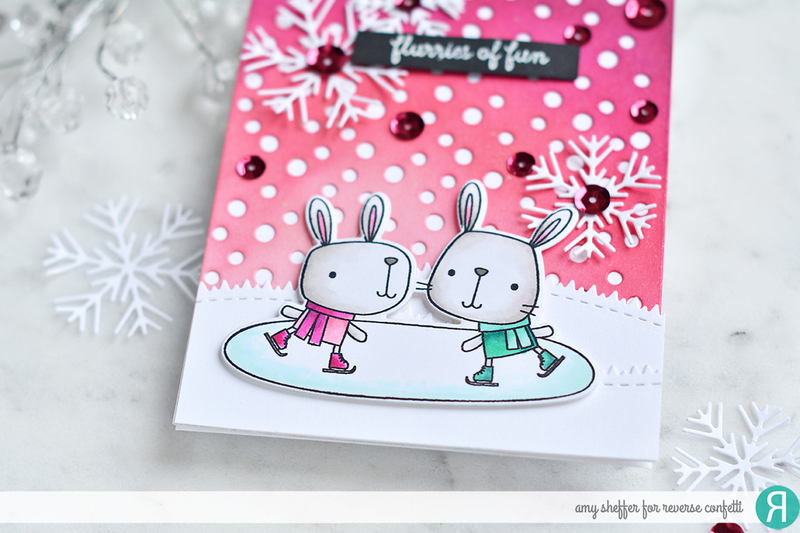 My card for today features SNOW BUNNIES as well as a super fun new die called the SNOWBALLS COVER PANEL. I started with the background. I die-cut a white panel with the new SNOWBALLS COVER PANEL Confetti Cuts and then ink-blended with Flamingo, Magenta, and Wine inks. 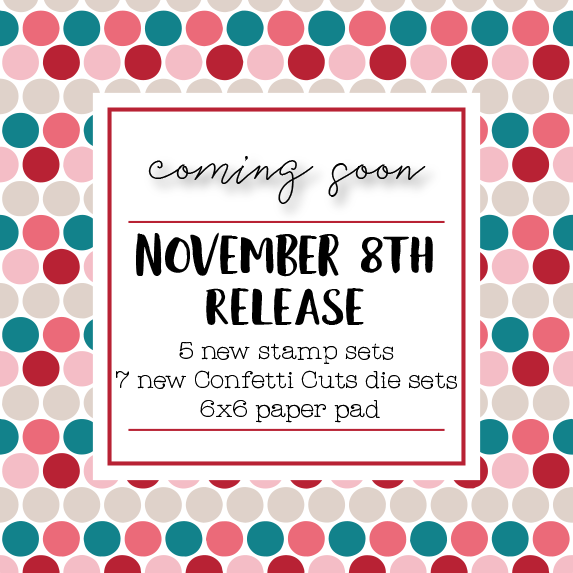 (My inspiration came from fellow Confetti Crew teammates Tricia and Olga, who always have the best ink-blended backgrounds!) I layered that over a Premier White card base, then added the snowy hills, which were done with a die from the NUTS ABOUT YOU Confetti cuts set. Next comes the ice skaters from the SNOW BUNNIES set, which are colored with Copics. 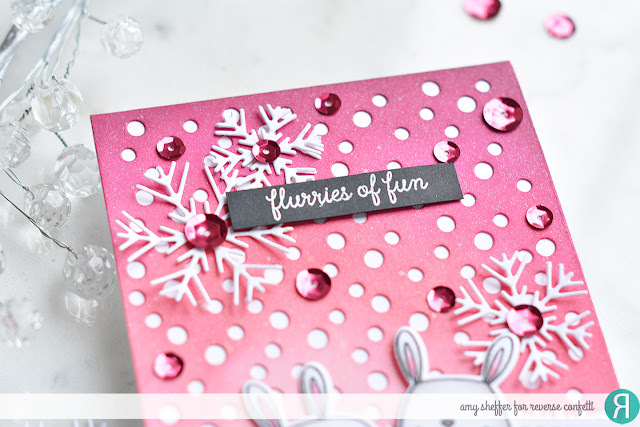 I added some shimmer spray to the background, a few Snowflake Trio diecuts, a sentiment, and some bright sequins. oh my, so cute! I love that blended background, the colors are fabulous. So cute! Love the super blending with snowflakes on top of the panel. I love those bunnies. They are adorable. Awesome, I love the colors you used on this card! 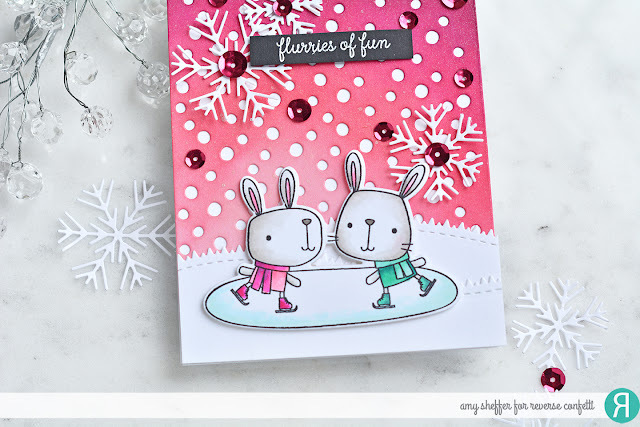 Love your colors and background and those bunnies are adorable. Just a darling card! Love it! This is too cute! I love the background and the sparkles! Love the background for the cute skating bunnies. The skating bunnies are SO cute. I like the background, too! Your PINK SKY is so cute! I love how non-traditional it is. Cute as can be! Adorable card! Love your colors and details! Absolutely adorable card! Love the vibrant pink. Such a happy card. super cute, love the pink!